The number of clients of companies that provide genome research services is growing at a rapid date. This marks a rapid change in a country where geneticists were once persecuted and imprisoned. 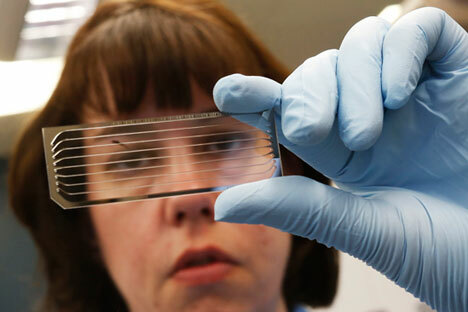 The market for genome research is developing rapidly in Russia. The number of people resorting to DNA tests, according to data provided by the Genotek laboratory, is steadily growing by 10-12% per month. "The market for genome research is very dynamic and a large number of people in Russia are now working to obtain genomic information," says Marianna Ivanova, founder of Oftalmik, a company that provides the genetic diagnosis of eye diseases. More and more DNA research companies are entering the market. Another new project by Atlas Biomed Group inspired by the American company 23andMe will be launched in late September. Companies offering health-related and genealogical DNA testing appeared in Russia not long ago. The company My Gene has been in operation at MSU Innovation Park since 2007. It offers a non-invasive prenatal diagnosis of fetal chromosomal pathologies. My Gene representatives claim that the method they use was developed just two years ago and is only used in six other laboratories in the world: one in China with the remainder in the United States. Companies focusing on the research of specific genetic conditions are also enjoying success. For instance, the St. Petersburg company Sequoia Genetics has collected more than 1,500 DNA samples from patients with cystic fibrosis. Oftalmik, based in Moscow, specializes in the genetic testing of people that suffer from eye diseases. Not long ago the international pharmacological concern Roche began participating in genome research in Russia. Several years ago Genotek, another new company offering genome testing, appeared on the Russian market. Its business model was also inspired by the American firm 23andMe, which was created in 2008 by Linda Avey and Anna Wojcicki, the former wife of Google founder Sergey Brin. In 2013 the U.S. Food and Drug Administration (FDA) banned the sale of kits for personal genetic testing that American company 23andME was producing. The FDA was concerned about possible errors in the test that could bring harm to the health of the company’s clients. Thus 23andMe stopped offering clients tests that checked for predisposition to diseases and focused on research in the field of genealogy. Russians are mostly interested in health-related testing because genetic research is expensive and people are not willing to spend money simply to satisfy curiosity. However, there are clients that are interested in genealogy testing. It was not that long ago that a notorious Russian politician did a haplogroup test. "We found out that he had common ancestors with Napoleon, Einstein and Hitler,” Valery Ilinsky, Director of Genotek told RIR. “He was proud of it and told other politicians that Napoleon was his relative." According to Marianna Ivanova of Oftalmik, all necessary equipment for proper decoding can be found in Russia. For example, the supercomputer Lomonosov, one of the 100 largest supercomputers in the world, is in use at the MSU biotechnology cluster. Clients of Russian companies still have to pay more for genome research than in other countries. Whereas in the U.S. a test can be done for between $100-200, in Russia it costs $600-800. It is therefore unsurprising that many clients search for testing opportunities abroad. However, removing biomaterials from Russian territory is prohibited by law. People have had to come up with various tricks. Tubes with saliva are often sent via friends and acquaintances living in the U.S. or Europe. The forbidden science: what was it like to practice it? It is difficult to believe now that geneticists were persecuted in the USSR beginning in the 1930s. Official propaganda claimed that citizens of socialist countries could not have genetic diseases and that discussions about genes were the foundation for racism and fascism. The American scholar Hermann Muller, a Nobel Prize laureate, wrote that being a geneticist in the USSR was like the inquisition for Galileo. The Director of the Institute of Genetics of the Academy of Sciences of the USSR himself, Trofim Lysenko, stood at the head of the campaign to persecute researchers. Many talented geneticists were arrested and killed in confinement. For example, Nikolai Vavilov was accused of being an English spy. He consequently died of malnourishment in a Saratov prison. In 1948, Josef Rappoport, who had discovered chemical mutagenesis, was told to renounce the chromosomal theory. He refused and was dismissed from the institution where he worked. Student-geneticists who visited their professors in prison were also harassed and arrested.